Standard Live Blackjack : the standard Evolution Live Blackjack games run off the traditional rules of European blackjack familiar to most players and easy for newbies to pick up. Each standard Evolution Blackjack table has seven seats available, with a bet-behind option and additional side bets including Perfect Pairs and 21+3. Blackjack Party : Evolution’s Blackjack Party has become incredibly popular with online players, offering a quirky take on the classic game. 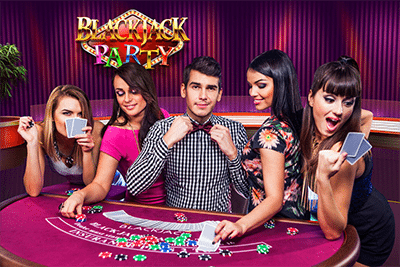 Blackjack Party is hosted by a duo of bubbly croupiers who have been trained for TV to provide players with a thoroughly engaging, entertaining gaming experience. While the main focus here is on fun, players still get to enjoy the excitement of real money 21. VIP & Platinum Blackjack : high rollers can step things up a notch in a selection of Evolution’s VIP and Platinum Live Blackjack rooms. These sophisticated VIP 21 rooms are hosted from the same opulent settings you’d expect from a VIP lounge in a real life casino to provide a feeling of added luxury. Evolution’s VIP blackjack games have some of the highest minimum bets you’ll find anywhere on the Net, with Platinum VIP Live Blackjack starting at $250 per hand and Diamond VIP Live Blackjack attracting the super-elite with a minimum bet of $1,000. Like a majority of live dealer games, a real money account is required to play Evolution Live Blackjack. For the best, safest online gambling experience, we recommend Guts.com and Thrills.com where you can also click our links to receive some sweet welcome bonuses including matched deposits and free spins. Sign in to the casino, deposit some AUD funds and head to the live dealer section. You’ll be given the option to choose from a range of blackjack tables that are currently open. If a table is full you also have the choice to place a bet-behind wager, which allows you to bet behind the main seven players seated at the table while you wait for your turn to enter the main game. Once you enter a game you’ll notice that some players may have a gold medal next to their name. This is a sign that the player is on a hot-streak, with the number on the medal signifying how many rounds the player has won. When it’s time for a new game to start, a message will come up on the screen asking to place your bets. Use the chips at the bottom of your screen to place your bets in the designated space in front of you at the table, and follow the dealers prompts to place additional bets or stay. New games begin every couple of minutes and you can play as many or as few rounds as you like. 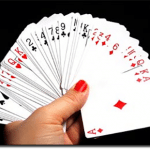 Perfect Pairs – placing an extra Perfect Pairs wager means you’re betting that the first two cards you are dealt are a mixed, coloured or perfect pair. 21+3 – choosing to place a 21+3 bet gives you an extra chance to win on a range of poker-style combinations resulting from your first two cards and the dealers first face-up card. Like Microgaming’s live dealer blackjack range, Evolution live 21 has fully customisable options so players can tailor their gameplay to their personal taste. You can use the menu bar to alter the table view, lower the video streaming quality to suit your Internet connection and view your game statistics. Live chat – one of the major drawcards for players in a land based casino is the atmospheric buzz in the air where people from all walks of life gather together to enjoy the casino ambience and excitement of playing for real money, an element that’s lost when playing a computer generated game. The beauty of Evolution live games it that not only are the games hosted by friendly, chatty real people, but players also have the choice to mingle using the live chat function. Whether you join the conversation or not is entirely optional, so you have the choice to be as social or as passive as you please. Live casino studio – Evolution’s Malta and Latvia based studios are second-to-none, providing the highest quality casino studios you’ll find on the Web. Both studios are purpose built and state-of-the-art, with highly trained, immaculately presented male and female croupiers on standby to host your games with the same level of professionalism you’d expect to find in a bricks and mortar casino. 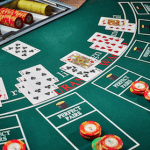 Given the popularity of these games, there are many tables operating at once so when you play live blackjack you can see other games in action in the background, replicating that hustle and bustle feel of playing in a real casino. Pre-Decision – Evolution live blackjack games include a Pre-Decision feature, which allows players to make their decision whether to stand, hit, double down or split at the same time as the first player so you don’t have to wait your turn. This makes games speedier than ever and gives you more active game-play time. Want to give Evolution Live Blackjack a go? Sign up at Guts Casino and make a deposit and new players will receive free spins and matched deposit bonuses.